A few weeks ago I made a Corn Chowder with Bacon & Basil that I absolutely devoured. Fresh and seasonal, I loved the contrast between the sweet corn, smoky-salty bacon and fragrant basil. So when I saw a recipe for Pasta with Bacon & Corn Pesto on Serious Eats last week, I decided I had to make it immediately. Instead of going the pesto route with pine nuts and olive oil, I wanted something more reminiscent of creamed corn. I crisped my bacon, then cooked the corn in the bacon fat. 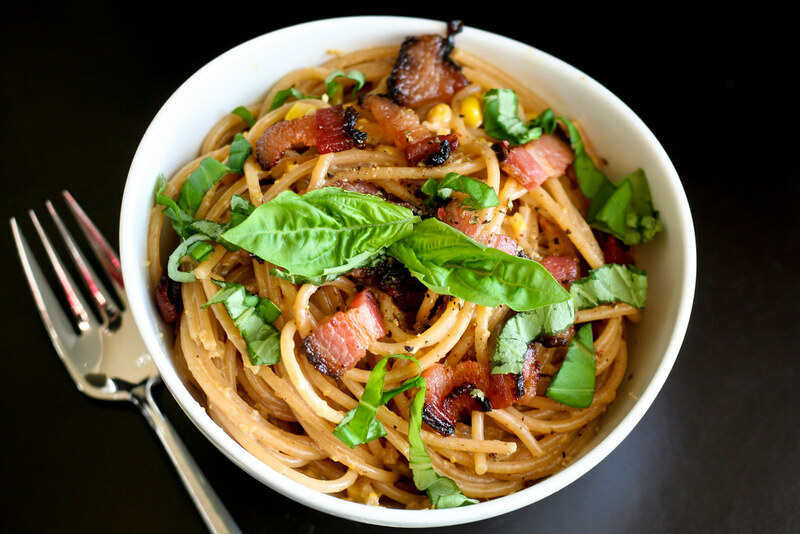 I pureed some of the corn with a little cream and Parmesan cheese into a creamy yellow sauce which was tossed with the bacon and spaghetti and topped with basil ribbons and lots of freshly ground pepper. This pasta is even better than the chowder. Same lovely flavor combination with all the addictive goodness of pasta. I followed my meal up with a juicy peach, making me glad that it’s summer despite the stifling heat. A perfect meal. Set a large skillet or wok over medium-high heat and cook the bacon until the fat renders and begins to turn golden. Remove with a slotted spatula to paper towels and set aside. Add the corn kernels to the skillet and cook for about 5 minutes, or until they are just tender. Remove from heat and place half of the corn in a food processor or blender. Add the cream, cheese and salt and pulse until smooth. Return the creamed corn to the pan and mix with whole kernels. While you’re preparing the corn, set a large pot of water to boil and cook your pasta until almost al dente. Transfer the pasta directly from the pot into the skillet, allowing some pasta water to transfer with the noodles. Add the bacon and pepper and toss the spaghetti with the corn until evenly coated. Serve and sprinkle with the basil leaves and more Parmesan. This looks awesome!!! This is going on my have-to-make list. Thanks! i saw that same recipe and made it two days later with fresh sweet corn from down the road. we loved it as well! this looks like something I could dig into with joy and be rewarded for having done so. tip ~ if you can get Nueske’s bacon, try it. it is made here in Wisconsin, and it is so good. This is simply beautiful to look at and I bet yummy to eat! I have basil and tomatoes in garden so it is perfect meal to make! I think applewood smoked bacon would go really well with this also I am really loving cilantro these days and think i will make this with cilantro, thanks for all your great recipes! Oh. My. Gosh. This was AMAZING. I used fresh basil fettuccine, and just to be a little more decadent, I topped each dish with 2 sauteed scallops (sauteed in the bacon fat, of course) and a drizzle of the bright orange tomato puree/sauce I made. I also put up some corn today, so I boiled the fresh pasta in that water. Seriously, so so so good. Thank you! 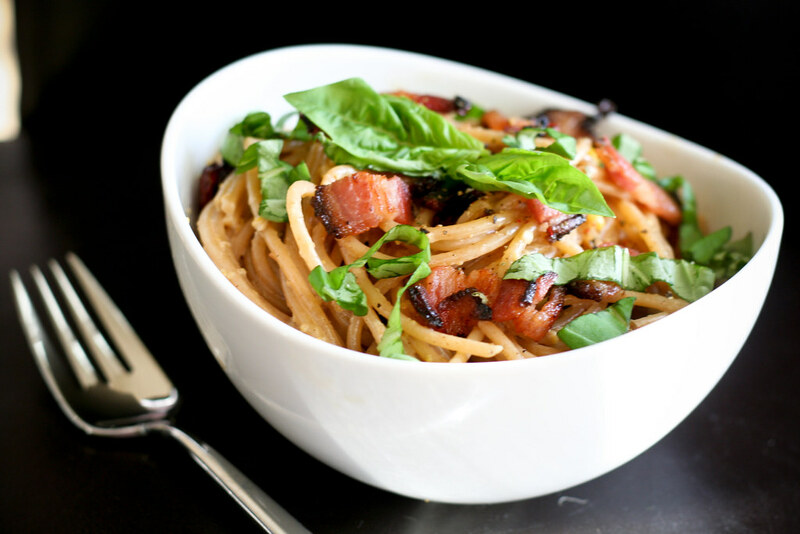 This is a fun pasta recipe that my family really loved. I recommend adding the chopped basil when you add the pasta to let the flavor infuse into the dish. Delicious! Quick and easy and the combination of the flavors was fantastic. It was light which I didn’t expect due to the whipping cream and bacon. I’ll be making this much more often! I can survive on Pasta for days long! This dish looks so colorful and lovely .. plus corn.. yummy.